Sometimes what you think works, does not work as good as something else. For example, most runners are advised to stare straight ahead when running. 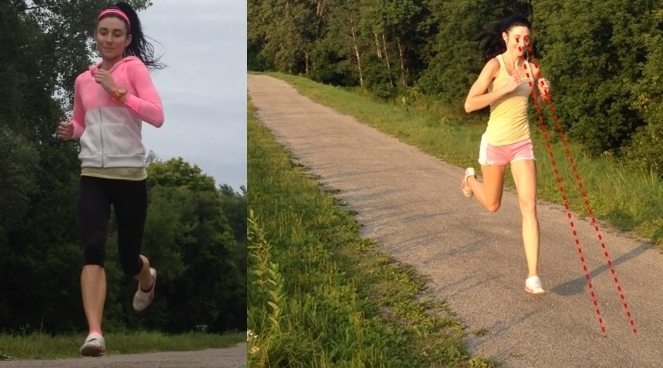 Where you look while running can have a major impact on biomechanics, particularly balance control. From a neuro-motor standpoint, looking at the ground to monitor surface characteristics when running may prevent unexpected postural disturbances and improve overall dynamic stability control. Staring directly ahead of you, at a distant object, may increase difficulty of maintaining balance while running, simply because you cannot see where you are stepping. Where you look while you run may also influence the motion of the center of mass (COM). For instance, staring straight ahead with the chin held up, may cause the head to tilt slightly back, thereby pushing the COM back while running. This may create braking to a small degree, but nonetheless, braking should be avoided while running, for obvious reasons. Likewise, looking down at the ground to monitor where you are stepping may allow the head to tilt slightly forward, allowing the chin to drop slightly and may draw the COM forward thereby fueling forward momentum. In the past, I looked straight ahead as I ran, but I was always injured. Although, many factors contribute to running injuries, my aches and pains disappeared after I began looking down at the ground during my runs. I found that by looking down, shortened my stride, increased my cadence, increased the height of my back-kick, and helped my center of mass shift forward when running. I gaze roughly 3 to 5 feet in front of where I am stepping. As you can see, I am not running with my head down, rather my head is held in a neutral position, same position as if I was walking, or slightly tilted downwards. My body was able to travel forward with less resistance compared to when I would gaze up at the horizon when running. Overall, my stride feels smoother and faster when continuously looking down at the ground. I try to focus on gazing down at the ground for as long as I can without looking up. Before I know it, I am done running. Obviously, I have to look up occasionally to see where I am going, but I immediately reposition my eye gaze down at the ground. Sound familiar? If you are familiar with the best distance runners in the world, Tirunesh Dibaba, Tiki Gelana, and Haile Gebreselassie, you may have noticed they stare at the ground when they run as opposed to staring straight a head. Bare in mind that these runners, like myself, are forefoot runners, not heel strikers and these runners were once exceptional barefoot runners, unlike myself. Most Ethiopian runners ran barefoot until mid-late adolescence and train on terrains that have a high degree of surface irregularities. For instance, they train in wooded areas that many joggers would stay away from. Running on uneven terrain, especially when barefoot, forces the central nervous system to direct eye gaze to the ground to promote anticipatory movements for better stability. Looking down while running on uneven, rocky paths seems to be a reflexive response of the body to ensure adequate impact-moderating behavior, balance control, and avoid plantar discomfort. As mentioned briefly, looking at the ground while running heightens anticipatory movements, preparing you for the next step. By not visually monitoring surface characteristics, and by gazing straight ahead, or looking around at your surroundings, visual anticipation and balance control may be heavily comprised. Let Your Eyes Control How You Run, Look Down! To appreciate the depth of the effect eye gaze has on biomechanics, conventional beliefs on biomechanics instructs runners to hold the head up and stare straight ahead; however, high injury rates in running has remained unchanged, so how is this piece of advice validated? And finally, many non-African elite distance runners, who also tend to stare straight ahead while running, seem to have greater upper body tension/stiffness as well as greater stride rigidity compared to Ethiopian runners who have a much fluid, smooth, effortless stride. What are the Best Minimalist Shoes for Forefoot Running?